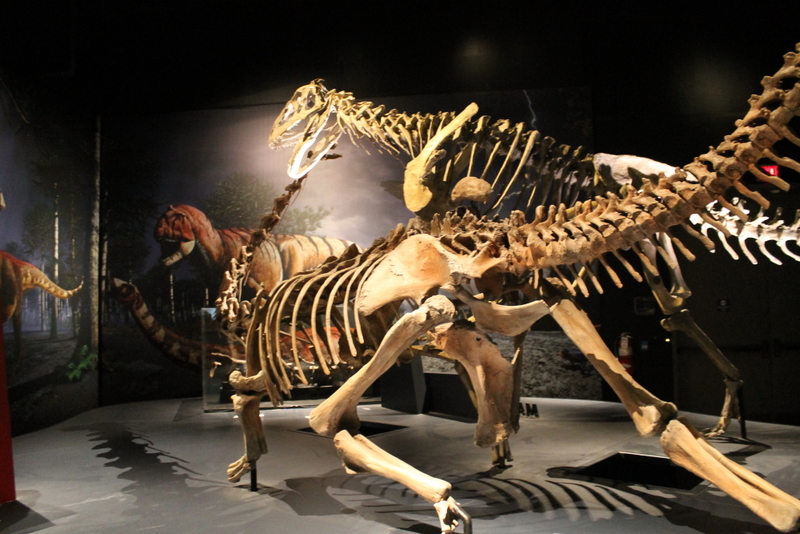 Ultimate Dinosaurs: Giants from Gondwana premiered in June 2012 with considerable fanfare at the Royal Ontario Museum (ROM) in Toronto. Developed by a ROM team led by David Evans and Matthew Vavrek, Ultimate Dinosaurs showcased the dinosaurs of the southern hemisphere, demonstrating how geographic isolation created Mesozoic ecosystems remarkably different from the menageries we are used to seeing in North American museum displays. The exhibit included 20 dinosaur mounts in all, including many taxa never before seen in museums above the equator. I never made it to the inaugural showing of Ultimate Dinosaurs, but fortunately the show is now on the road. I saw it at the Cincinnati Museum Center (CMC) earlier this week, where it will remain through January 5th before moving on to Minneapolis. The exhibit assuredly does not disappoint…read on for many pictures and my musings on the design. 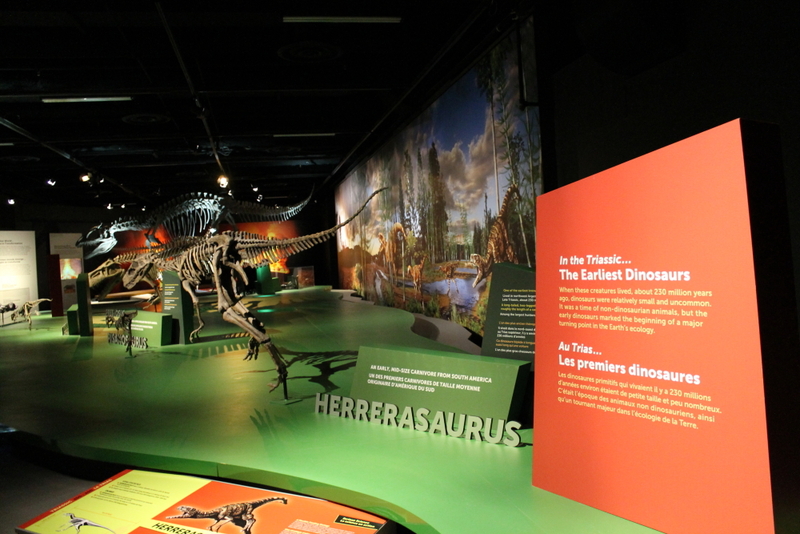 The first room features Triassic and early Jurassic archosaurs. 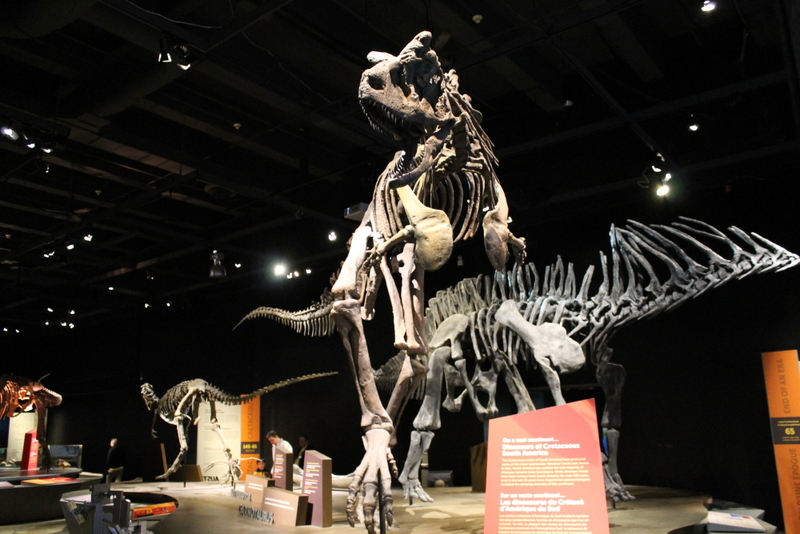 Huge banners displayed outside the CMC and in the main lobby are impossible to miss, but the Ultimate Dinosaurs exhibit itself is hidden away on the lower level, with the entrance at the end of a quiet corridor. Aside from a video screen showing a shifting map of Gondwana, no proper introduction is provided. 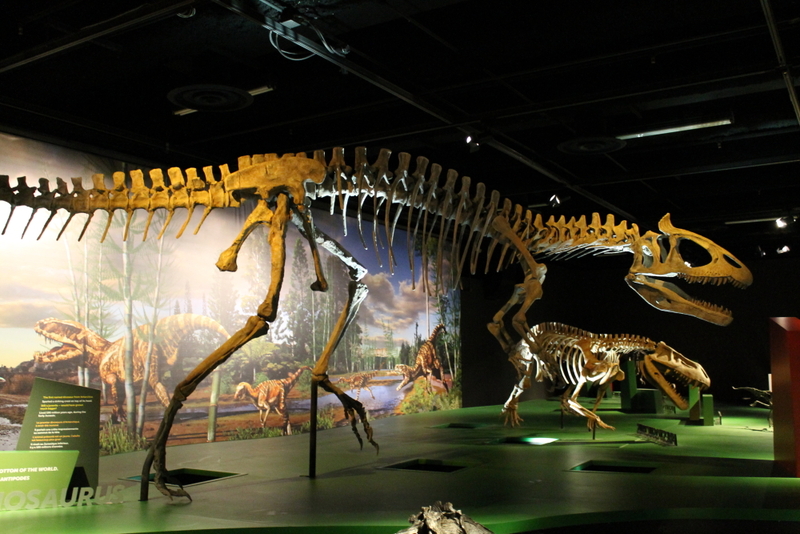 Visitors immediately find themselves in the first large room of fossil mounts, featuring Triassic and early Jurassic archosaurs like Herrerasaurus, Eoraptor, Cryolophosaurus and the rauisuchian Prestosuchus. This first batch of mounts is lined up on an elevated platform that runs along the right side of the room. Like all the mounts in Ultimate Dinosaurs, these are casts, and are plainly assembled in “chunks”: numerous bone elements casted together as single pieces. While these shortcuts are obvious up close, this mode of construction does allow for remarkably dynamic poses, and there is no obstructive armature to block one’s view. Behind the dinosaurs is the first of several gorgeous Julius Csotonyi murals, a lively panorama of life reconstructions in a naturalistic setting. In front of every mount is an array of attractive signs in bright, solid colors. Information is mostly provided in short sound bites or bullet points, highlighting sensible information like the animal’s diet, the meaning of its name, where it was discovered, and why it is scientifically noteworthy. There is also at least one touchscreen in front of each mount, which includes several more pages of information for the more dedicated visitor. I really liked the similar touchscreen displays at the Carnegie Museum, and these are equally impressive. This is technology used intelligently, contributing to but not overwhelming the primary display, while using space in an economical way. I was also impressed by the succinctness of the text. It is very difficult to condense information into short blurbs that visitors can absorb with no more than a quick glance, but the Ultimate Dinosaurs writers balanced accuracy, intrigue and brevity on every single sign. Hats off to them! Visitors were having a hell of a time pronouncing Cryolophosaurus. Turning left at the Massospondylus at the far end of the first room, visitors enter a long and largely empty corridor. The left wall is adorned with a series of signs explaining the historical discovery of and evidence for continental drift, and herein lies my primary concern with the exhibit as a whole. The story being told in Ultimate Dinosaurs, regarding plate tectonics and its effect on evolution, is an important one. Paleobiogeography is key to understanding how the natural world we know today came to be. What’s more, it’s a great example of science in action, consisting of a handful of intuitive, evidence-based concepts that can be applied to new situations and clarify new discoveries. As such, paleobiogeography ought to frame the entire exhibit. I would have placed the big ideas and central questions (Why are similar organisms sometimes found on opposite sides of oceans? What happens when populations or ecosystems are isolated from one another?) at the beginning, and ensured that they were reinforced in every display with recurring terms, imagery and motifs. 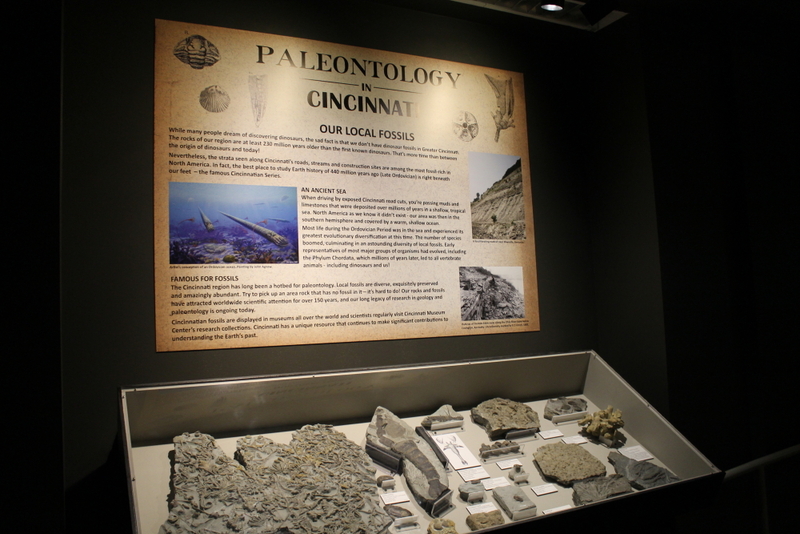 The paleobiogeography story should guide the visitor’s experience and understanding of the exhibit. Instead, Ultimate Dinosaurs at the CMC relegates the big ideas to secluded corners and easily-missed signs. The text itself is very clear and well-written, and supported by attractive, intuitive graphics, but it’s hidden away and or otherwise overshadowed by lists of factoids about each dinosaur. My largely unsubstantiated suspicion is that the original designers of Ultimate Dinosaurs at the ROM intended for the paleobiogeography story to be much more explicit, but this vision was compromised somewhat in order to fit the exhibit into the space available at the CMC. The unfortunate result is that the most critical information is introduced in an unorganized manner, and the exhibit is weaker for it. Suchomimus peers in from the right, Malawisaurus in the middle, Argentina in back. After passing through the switchbacking corridor, visitors reach the primary showroom. This is an enormous space filled with huge, impressive dinosaur mounts. Like the rest of the exhibit, this gallery is quite dark, with floor lights and the occasional overhead light highlighting the dinosaurs. The darkness helps to hide the unadorned walls and ceilings of the multipurpose space being used, but thankfully does not hinder one’s view of the dinosaurs. And the dinosaurs certainly do not disappoint. Even though they are casts, this exhibit was my first opportunity to see the likes of Armagasaurus, Suchomimus, Ouranosaurus and many others in person. I could walk around them, take in their scale and compare them to one another and to myself, experiences that no image or documentary can provide. Majungasaurus and Rapetosaurus strike an extreme pose. Most of the dinosaurs are in lively poses, as though the animal was frozen midstride, but a few are especially dynamic. Little Rahonavis is suspended from the ceiling, as though leaping for prey or perhaps engaging in a controlled glide to the forest floor. The Majungasaurus and Rapetosaurus, which are the only mounts directly interacting with one another, are particularly interesting. The attacking Majungasaurus has its foot up on the flank of the Rapetosaurus, and the sauropod is in a rather unusual squatting pose, with its forelimbs at what appears to be maximum flexion. I will leave it to the experts to decide whether this extreme pose is plausible, but this nevertheless serves as a reminder of what can be learned by assembling a skeleton in three-dimensional space. The mounts are clustered on three islands, representing Argentina, Madagascar and Niger. I do wish this organization had been made clearer to visitors, perhaps with large banners over the islands naming the dinosaurs’ location of origin. Clustered at the feet of the mounts are small cases containing a mix of original and casted fossils. Some of those are quite relevant and provide further context to the mounts: for instance, a collection of North African fossil fish near the Suchomimus illustrate the spinosaur’s probable diet. Other cases are a bit more perplexing. A series of cervical vertebrae from the North American sauropod Suuwassea is arbitrarily situated among the Madagascar mounts, and cases of cephalopods and Carboniferous plants are similarly out of place. Most of these oddball fossil displays did not come from the ROM, but were added by the CMC from their own collections. Although these fossils are fascinating and should absolutely be on display, I don’t think randomly interjecting them among the Gondwanan dinosaurs was the way to go. These displays interrupt the primary storyline and probably should have been placed elsewhere. These additions from the CMC are neat, but a bit out of place. 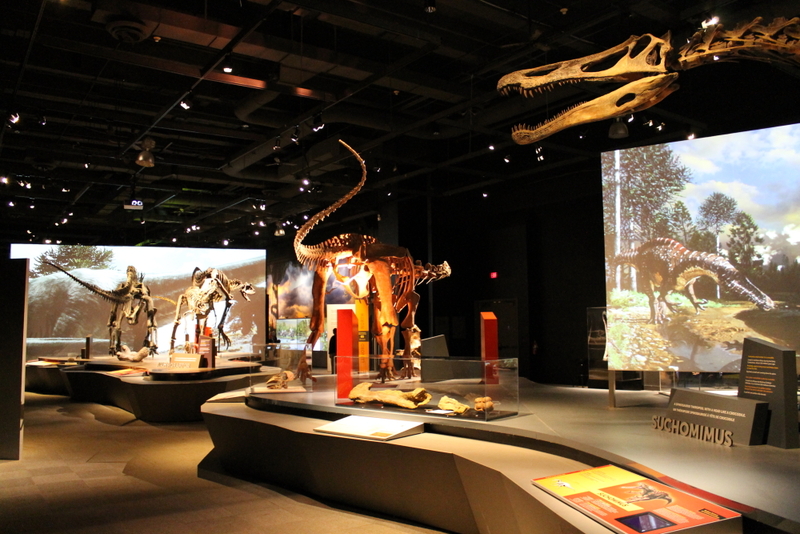 The final room showcases the exhibit’s two largest mounts, Tyrannosaurus and Giganotosaurus. It is undeniably exciting to see these two giant predators side by side, and compare how these ostensibly similar carnivores were nevertheless subtly adapted to tackle different prey. I would have made this point more obvious than the exhibit does, but I suppose sometimes you need to step back and let your specimens speak for themselves. This room also features the much-ballyhooed “augmented reality” gimmick. These are tablet-sized screens found alongside the mounts. When you point these at the Tyrannosaurus and Giganotosaurus skeletons, a CG version of dinosaur appears on the screen. Panning and tilting the tablet in front of the mount causes your view of the CG version to adjust accordingly. I found these sort of interesting, but they were not nearly as impressive as the mounts themselves. Unfortunately, the CG dinosaurs simply didn’t look very good. I am all for the use of technology in museum exhibits, but only if it plays to our strengths. In this case, the CG dinosaurs are directly and unfavorably comparable to a wide range of films and television shows that people can see without leaving home. As hubs for lifetime learning, museums can and should offer more than that. Tyrannosaurus and Giganotosaurus side by side. Eat it up, internet. Despite my nitpicks, Ultimate Dinosaurs really does live up to its name. This is a very handsomely designed exhibit, and an great opportunity to see mounts of exotic dinosaur taxa. 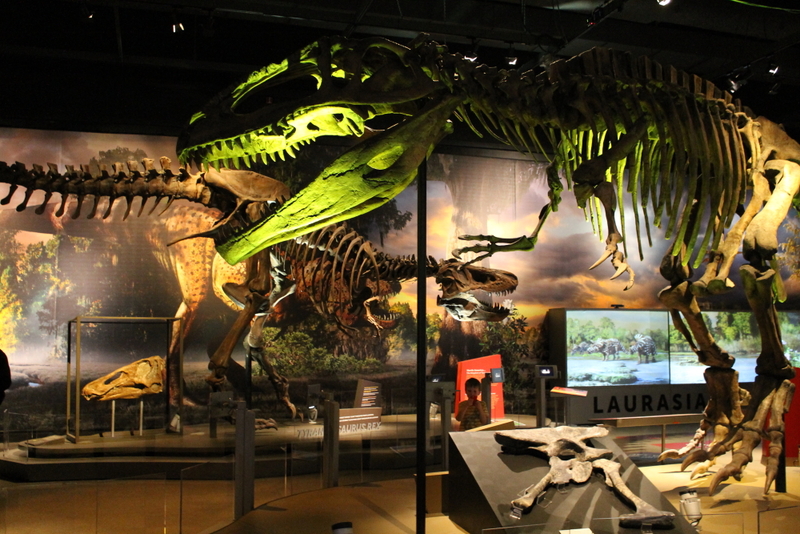 If you are at all interested in paleontology, catching this exhibit is a no-brainer. But even if you’re not, this is a rare chance to see what the vertebrate fossil record has to offer beyond T. rex and Triceratops, and learn a bit about how our world came to be. Edit: I had mistakenly said the murals were created by Raul Martin. They are the work of Julius Csotonyi. This looks like a really cool exhibit. I wonder, is it coming to New York City? Or did I already miss it? Cincinnati was the first stop in the US, and Minneapolis is apparently next (http://www.twincities.com/localnews/ci_24122055/ultimate-dinosaurs-exhibit-coming-science-museum). I don’t know about New York specifically, but I’d expect it will be on tour for awhile. Reblogged this on The Jurassic Inquirer. It seems another menagerie of skeleton mounts is traveling the world now, called Tyrannosaurs: Meet the Family. It only has 9-10 skeleton mounts(including the chicken skeleton), but some of the skeletons are of taxa not usually displayed in museums, such as Dilong. It was produced by the Australian Museum, and has gone to New Zealand and Canada. Right now, unless FMNH or the Minnesota Science Museum decides to host the exhibit, it’s probably the closest to the Chicago area it’s gonna get. It’s right in the next state over, Iowa, in the Des Moines Science Center. It’s going to be on exhibit until April 22. I think there’d be a lot you could applaud and probably rant about. (There’s one of those damn projection screens that have no use in the exhibit). Here’s a link down below to the website in case you want to check it out. I did write some stuff about it on my own blog(link is below). The Australian Museum does mostly cover everything in that video, but the exhibit actually doesn’t fit in the Science Center of Iowa, so it turns into a sort of weirdly organized exhibit.